But you don't have your charter number on it! St Augustine Senior Squadron is making the change from a Senior Squadron to a Composite Squadron so time to redesign our patch. I would like to thank Capt Chuck Corway for his hard work on this patch. We designated that we wanted the St Augustine Lighthouse and the GA-8 Airvan. left the rest up to the good Capt. Not bad at all, nice elements, good work Capt Corway. Some suggestions though. Shrink the rockers down, about a 1/3, that way they are a little more proportional with the center circle. Also, have someone render the image of the lighthouse so the perspective is straight on. With the way it is now, the image gives you the idea that you are looking up at it, and then when you have the GA-8, it's a perfect side view; kind of hard on the eyes. Either that or change the GA-8 so it's matching the orientation of the lighthouse. The field could use a couple more elements. Consider more of the area's history, which seems rich according to what I just researched, add a few more nautical elements, such as nautical stars, or canon's from 1800 era ships. Thanks for the suggestions... As it was mentioned it's still a work in progress, and may change after review. How about an alternative wing patch? NYWg members that complete LIGSAR School can wear the patch in place of the NY Wing patch. 'Fresh off the boat' from Hong Kong! Got them through Patches4Less.... great price and Luke is a great guy to deal with, I'll be working with them again! They look so much better in person, the material really shimmers in the light! I'm happy! But Hong Kong is in a Communist Country!! Ozzy, that LIGSAR patch is pretty sweet, you have any laying around you'd be willing to swap for? Maybe its just me, but I would point the airplane in the opposite direction. For some reason I get the impression it is flying in the "wrong" direction. I LOVE THIS PATCH! LOL. Can it replace the NYWG patch in NYCG as well as LIG? I was planing on going next year if i can. I'll see if I can find one. I personally don't have one myself, I haven't been able to get to a LIGSAR academy... it's always been during some event or class I have to do. However, once I get one that I wouldn't be posting on my uniform, I'll send one to you. You can really mess with their heads and become the Long Island Group 8 of California Wing! LI isn't on the NYWG patch? I think its on mine, maybe they modified it. Vanguard, must be imagining it, so used to seeing maps of NY with LI. And LIG better not leave us! ISP is practicly the CAP ES capital of NY! Group and above should be a shield with a scroll underneath. But that's only if you're going to follow the AF heraldry that's been talked about before in this thread. The shape and color scheme of the LIGSAR patch kinda remind me of NJWG's GSAR parch. The AFRCC angel is a nice touch, IMHO. So in know this may be tooting my own squadron's horn a little bit, but SWR-TX-388, or Phoenix Composite of Fort Worth, Texas, has an outstanding patch that actually depicts the squadron. The patch has the shape of Texas with the mythical Phoenix rising from the ashes on it. This is really what our squadron has done in the last year or two. I just thought I'd throw that out there to give our squadron a little bit of popularity on CAP Talk. ...with the mythical Phoenix rising from the ashes on it. This is really what our squadron has done in the last year or two. 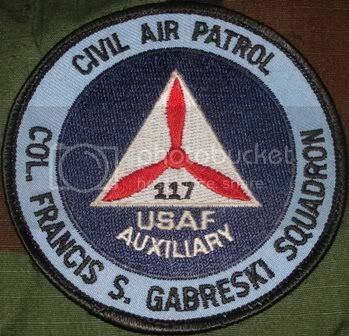 That was the main focus on my original squadron's patch -- for the same reason, as well. The squadron went through a large period of inactivity, and was later revamped (went as far as to earn some pretty high honors within the wing). Can you hook a brother up with a copy? I've only found the image you linked to so far, and I'd love to preserve an actual copy!